Pioneers in the industry, we offer wire harness assemblies from India. Our firm is specialized in manufacturing and supplying a quality array of Wire Harness Assembly. Our offered harness is used in push-pull meters in various industries such as consumer products and automotive. It is manufactured by utilizing the quality assured raw material combined with the latest machines and tools. Furthermore, the entire range is carefully inspected on numerous quality parameters to ensure the perfection of each and every product. 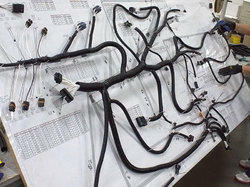 Looking for Wire Harness Assemblies ?